WiiWare World: Can you tell us a little bit about Studio Walljump? Nicholas Trahan: Lets see here... I started Studio Walljump initially as a game art contracting company, immediately after leaving Nintendo. After about two years, I decided I wanted to go for a Nintendo developer’s license, and I started working on a game concept that I felt I could present to Nintendo on my own, without any code. I told one of my best friends about the idea over the phone, and he had the basic concept working on the PC the next day. We continued to work on that prototype for about 3 months, and when it was ready I brought it over to Nintendo of America to present. They awarded us our license, and we’ve been converting Liight from the PC to Wii ever since. WW: What projects were you involved with in your former life working as an artist for Nintendo? WW: Where did the idea behind Liight actually come from? NT: I was doing a contract at another local studio, and an engineer had come up with some super sweet stencil buffered lighting system, but it was just a tech demo. A designer there sent out an email opening a discussion on how they could use it in a game, but all the discussions I saw were centered around using it as headlights for a tank. I made a few outlines for games that weren’t combat based, and one of them was an example of a puzzle you could solve with lights. It turned out they had a pretty clear policy against contractors submitting game ideas (for legal reasons I guess), so I tucked it away, and that became Liight. WW: What aspect of Liight do you think sets it apart from other puzzlers available or coming to the WiiWare service? NT: That’s an important question. There are some things that set it apart that are more subtle than others, so I’ll try to cover as many as I can. Of course, the lack of ‘falling blocks’ or really blocks of any kind is one thing people notice right away, but there’s a lot more to it than that. Being more of a ‘brain teaser’ style game than an action puzzler is another one, but there are other brain teaser games, too. 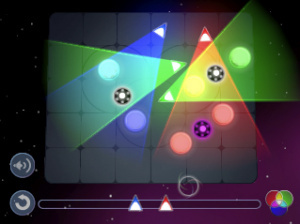 The musical aspect of the game, where a different song is randomly generated as you solve each puzzle, gives Liight much of its unique personality and feel. Liight is also very relaxing to play since there is no time element (with the exception of Nonstop and contests). It has the ability to make your own puzzles and share them, so there’s replay there if you’ve got friends. Nonstop mode is very unique and deep, and hard, and I doubt you’ve played anything like it. More than anything else though, the color-blending and shadow-casting type solving is pretty fresh, and that’s something you’ll have to play yourself to understand. Despite at first looking similar to something like, say Prism: Light the Way, it’s actually a completely different way of solving puzzles. WW: Can you tell us a little more about the core gameplay of Liight for our readers who might still not be clear regarding how the game is played? NT: You know, its funny because when I was having people test out the prototype, I would just say “Left click drags, right click rotates”…. And that’s it, not even anything about the goal of the game. Even non-gamers would figure it out within 30 seconds. But you show someone a screenshot and all you get is a big fat “WTF?”. It’s very intuitive when it’s interactive… not so much when you can’t touch it hear the puzzle react. 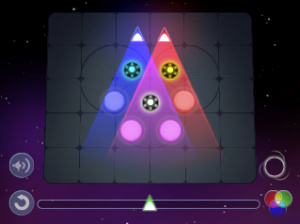 Each puzzle in Liight is a unique combination of colored lights and targets on a special board. 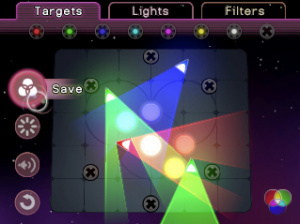 Completely covering a target with light of the matching color will make that target glow and play music. A puzzle is solved when all the targets are glowing and playing music together. Every puzzle sounds different each time you solve it! Playing Liight is easy. Point at a light with the Wii Remote and drag it onto the board by pressing and holding A+B. Twist your wrist to rotate the light. In Liight, you will often have to blend two lights together to create a new color. Some Puzzles have Black X targets that you must avoid. The lights themselves cast shadows, an important tool you will learn to use. There’s more to it than that… but I don’t want to give it all away! WW: Can you tell us more about the significance of the music that plays along with the lights? Does it play an important role in the game? NT: It plays an important role in being totally awesome! So, the game is silent with the exception of soft wind blowing, until you start to solve a puzzle. Imagine you drag your first light onto the board, and light up a target, and it plays some neat little melody, just one instrument. Then you light up your next target, and a bass line kicks in. You screw up the first one somehow, and the melody fades back out. As more targets are lit, things layer and you really start to get some cool songs made up. Our sound guy made a huge library of techno loops that are all compatible with each other, that’s what the MP3 on our website are made out of. Those aren’t songs you unlock in the game; they’re just possible combinations that could happen. There is always a button to mute the music on the screen too, in case you’re having a hard time concentrating on the puzzle with all that music going. WW: You've mentioned that the game allows the player to send puzzles and host contests with their online friends via the Wii online service. Can you tell us a bit more about this aspect of the game? NT: We’re still working out the exact details of what works best, but it’s all done via WiiConnect24. I can send a puzzle out to a group of friends, and they would all have a week to go play it. When they play that contest puzzle, they’ll be timed. The fastest solver will get a little trophy added to their trophy room. WW: It would seem that allowing players to create their own puzzles would add an almost limitless amount of replay value to the game. Was that something you focused on during development of Liight? NT: Yes. Obviously the main downside to having a brain-teaser style puzzle game as opposed to an action puzzle game is that once you run out of puzzles, you’ve got very little left to do. We needed an editor anyway to create the puzzles that come with the game, so including the editor into the game for people to play with just made sense. Hopefully people develop rivalries and take turns trying to stump each other. WW: Can you tell us a little more about the NONSTOP MODE and what it brings to the overall experience? NT: Nonstop mode is an action puzzle game that uses all the solving rules you’ve learned from the basic Solve mode in a new way. It brings two key things to the overall experience: First, it further addresses the replay issues by providing a game that you can play over and over again for score, without any friends. Secondly, it provides a deeper and more challenging game that less casual players will be able to appreciate. With most of Liight, we’ve been careful to make it easy and approachable to everyone while still maintaining a challenge for all skill levels. I’m not as worried about that with Nonstop mode… I just designed it to my own tastes. I hope people enjoy it! WW: What are your thoughts regarding the unique Wii Remote and what it brings to the play control in games for the Wii console? NT: I’m a big fan of the Wii Remote and the Wii in general and the new opportunities it opens up for fresh gameplay. Sometimes it’s frustrating that they don’t update the Wii hardware to be more powerful and include High Definition, though. 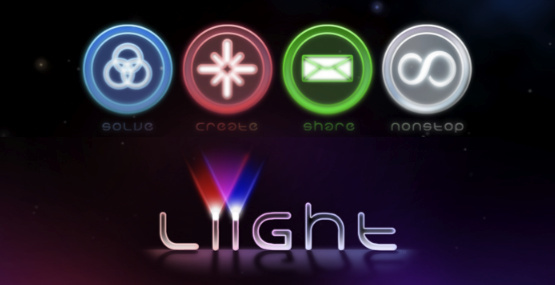 WW: Was there any specific aspect of development of Liight that proved to be a real challenge for you as a developer? NT: Nothing about Liight in particular is difficult, but even though it is a small game, just general production management has been a challenge for me. I’m near Seattle, Washington, the programmer is in northern Vermont, our middleware company is based in Paris, our sound guy lives in Oregon… it’s rare that we get face to face time. The time zones can make even email tricky. WW: Will there be any additional downloadable content made available after the initial release of the game? WW: There have been some complaints that there are already too many puzzle games available for the WiiWare service? What would you say to those gamers to sway them over to your game? NT: I’m a big gamer, and I’ve played a lot of puzzle games, and in my opinion Liight is a fresh experience. There’s no match 3, no making lines… it’s different. Your whole family can play it because its simple and you can take your time and think it through. But it’s still stylish and challenging for anyone. It’s not going to be that expensive, it’s got lots of replay value, and we’re committed to keeping the game under 16 megs. As far as there being a lot of puzzle games for WiiWare… that’s true, but I feel confident that no matter what other games you buy, you won’t already have anything that plays quite like Liight. That stands true not just among other WiiWare titles but video games in general, and it’s a design philosophy I hope to continue with all future titles from Studio Walljump. WW: What are some key advantages / disadvantages as a developer to creating a WiiWare title instead of an actual retail release for the Wii console? NT: From a design point of view, I don’t really see any major advantages to a retail release, with the obvious exception of the sheer amount of content you can include on a DVD. On the other hand there are plenty of advantages that WiiWare offers us! Bypassing the publisher is huge. Consumer expectations are more inline with what a small studio can offer. We can assume the player has internet connectivity. All sales are new sales. The list goes on! I only hope that the WiiWare marketplace doesn’t eventually earn a reputation for only offering certain types of games, otherwise it may get harder to sell games outside of what people expect to find. WW: Does Studio Walljump have any other WiiWare projects in development or possibly in the planning stages? NT: We have two other WiiWare projects in the early planning stages. At our size, we can’t really afford to throw away everything we’ve learned about WiiWare while making Liight, and move to some other platform and start over again. That said, after we release Liight in as many regions as possible, our next project will be something totally different. I wish I could say more, but I don’t want to spoil anything! WW: Can you tell us when we can expect Liight to hit the WiiWare service and how many Wii Points it will cost? NT: We’re still learning, sometimes painfully, how long certain aspects of game development can take. Especially the bits we have to rely on other people for. We were originally planning on being in the launch window, but it took forever to get our developers license and to choose our middleware, Virtools 3DVia. Now we’re aiming for early next year. Points is another thing, but I would like to see it at either 800 or 1000 points. I don’t want to see it go any higher. The original plan was Liight, 500 points, without Nonstop, at Wiiware launch. When it became clear we were going to miss that window, I decided we had to bulk up the title so it would still be a good value post-launch, and I think it will be. Now it’s got more game pieces, and Nonstop mode, which is huge. WW: Other than Liight, do you have a personal favorite WiiWare title? NT: I’m a huge NES fan and Mega Man 9 did not disappoint. I’ve really been digging that, it’s like a time warp I’m more than happy to jump through. I haven’t played a lot of other WiiWare titles that I’ve been particularly crazy about... it’s tough because I have a 360 too, so they’re all in competition for my time. I loved the idea behind StarSoldier R, but it’s no Ikaruga. Toki Tori was cool, but Braid is amazing. Lost Winds was slick but I finished it in 2.5 hours, it felt like 6 months of hype was over in the time it took to eat a sammich. I wish I had more time to play My Life as a King. I brought all my rare pokemon into Pokemon Ranch so I could take a picture of my Mii next to them, and that was pretty cool… but I wish it had some lasting effect on my pokemon. Plus it was expensive for what you get!! I’m picky I guess. WW: We understand your son is called Link, if it’s not too personal can you tell us the story behind this? NT: She wouldn’t let me use Erdrick. Looks interesting. I'll check it out after World of Goo. The fact that you can create puzzles and host contests definitely adds good replay value! I'm already sold. I'm getting this once it comes out. WC24 Usage is fantastic!!! Cool looking game and a really long interview, good job! I'll be sure to get this if review are good enough. Instant buy for me when it comes out.. it sounds really original and cool. I like the sound of Nonstop..
this looks like an amazing game, and is perfect for wiiware! a definate download! I'll admit, the more I hear about the game the more interested I'm getting. It's looking really cool. It was very nice of Nicholas to be so verbose and detailed. This definetly Sounds Essential. 800-1000 Points sounds like a steal and creating your own puzzles would certainly be great for replay value. Ask him who decided to cancel Project H.A.M.M.E.R. Well they keep saying that Project H.A.M.M.E.R. hasn't been cancelled, but rather moved to the "back burner" for the time being. I personally don't know if we'll ever see the game. This game looks pretty awesome! Original gameplay coupled with a simplistic design usually = win for puzzlers. If the price is right I'm sold. Great interview I'm looking forward to the other games they have up their sleeves, I enjoyed the last question too. Project Hammer will be released right along with Sadness. Sounds cool, and the Metroid HUDs were very slick and awesome looking so I have great faith in the presentation in this game. But I ahve to say, even though the game seems to stand out from the cliches of the genre, I'm more interested to hjear what he knows about Project Hammer's status, if anything. All you guys who "miss" project h.a.m.m.e.r..... never played project hammer. Interesting. The gameplay looks really fun, hopefully the difficulty isn't too easy/casual friendly. And yay for no falling blocks, lol! Anyway, I want this game! I can't wait to see what the other WiiWare projects are. I've found a lot of art people come up with ideas nobody else would think of- like turning color mixing into a game. The Project Hammer news is great! @ Metal Slime- What, did you play project hammer? Although as a newer Wii owner I don't know anything about it other than that it existed at some point and probably doesn't now. Yay! Another My Pokémon Ranch fan! But still, I would like more story regarding the "Link" story. What was your wife's adversion towards "Erdrick"? Why, out of all names, did you choose "Link" as the substitute? By the way, you repeated some screenshots in the interview. I've got to say, I love WiiWare's interviews. It's nice to hear smaller developers talk about their games, and about the gaming business in general, since they don't have to dodge 95% of questions or give boring PR responses. This is definitely the most interesting puzzle game to be announced so far, though that doesn't say too much, unfortunately. I had to repeat them. We only had 4 of them and that was a LONG interview. Sounds good, looks good. Hopefully it'll play well, too. I'm definitely keeping my eye on this one. 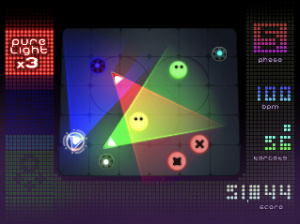 this looks really awesome, most original puzzler I've heard of in a while. Can't wait to play it. Wish it was coming sooner. "Twist your wrist to rotate the light." Sounds bad. I hope they'll change that or give us other options. This sounds like a decent puzzler. I keep an eye on this game. @Auntman: The twisting is totally natural, and its not a complete 1:1 twist, so if you want to twist something upside down, you don't actually have to turn your wrist upside down. @Metal Slime. Good to hear I wasn't missing anything then! I didn't read the whole interview, but I'll be keeping my eyes on this one. Looks very unique. I liked the answer to the last question by the way. Nice game. Not an instant buy, but I look into this. I think it's pretty neat to get a full sound when all targets ar lit, dood and this adding up target by target. It's like an instant reward for doing something right! SOLD!! Just give me a release date and I'll be there waiting.